This evening’s #PPDChat will focus on women of colour and mental health. The death rate from suicide for African American men was almost four times that for African American women, in 2009. However, the suicide rate for African Americans is 60% lower than that of the Non-Hispanic White population. I’ll give you a few minutes to read those statistics over and realize what they mean. Then I want to highlight two specifically. Taking those two statements alone, African Americans are 20% more likely to report having serious psychological distress than Non-Hispanic Whites BUT are less likely to receive a prescription which would help them deal with said psychological distress. How is that even close to okay? Mental health affects more than our minds, too. It affects several systems in our bodies with the stress it causes, it affects quality of life, it affects everything. Without it, we are not complete. It’s gonna be a good chat, y’all. This entry was posted in #PPDChat and tagged #mhsm, #PPDChat, african american mental health, minority mental health awareness month, Twitter Chat on July 14, 2014 by LHale. On July 13, Postpartum Progress turns 10. Since inception, Katherine Stone has done quite a bit in the world of Perinatal Mood & Anxiety Disorders. She’s fiercely led us forward, called people out on the error of their ways, and is whole-heartedly dedicated to making the world an easier place to navigate when women are struck with one of the issues on the spectrum of PMADs. Tonight, at #PPDChat, we’re going to talk about Katherine and what she’s done, what she’s doing, and share memories of how she’s helped us. Did you know she supported #PPDChat when it was just an idea in my head four years ago? She did. She’s supported quite a few of us as we’ve moved into advocacy and we are beyond grateful. Be sure to join us tonight at #PPDChat as we celebrate the woman, the work, and the sisterhood she has created. See you tonight at 830pm ET! This entry was posted in #PPDChat, advocate, blogger and tagged #mhsm, #PPDChat, Katherine Stone, Mothers, peer support, postpartum depression, Postpartum Mood Disorders, Postpartum Progress, Twitter Chat on July 7, 2014 by LHale. Last week, A’Drianne (@addyeB) hosted #PPDChat. She shared all about the upcoming #ClimbOut for Postpartum Progress (which, by the way, has surpassed the 100k goal!). If you’re interested in finding out more about this event, which happens this Saturday worldwide, you can read all about it here. Tonight’s #PPDChat welcomes leaders of various Climbs throughout the world. Get to know the women who have fought through their own battles with Postpartum Mood & Anxiety Disorders and are now doing something to help raise awareness of this insidious issue which affects 1 in 8 new mothers. I am SO excited to chat with all these passionate women tonight. I sincerely hope you’ll carve out an hour to join us at 830pm ET. See you then! This entry was posted in #PPDChat and tagged #ClimbOut, #mhsm, #PPDChat, mental health, Postpartum Mood & Anxiety Support, Postpartum Progress on June 16, 2014 by LHale. It looks like this: Thing is, those are all words. They don’t capture the journey one must MAKE to arrive at “carefree, radiant, joyous, beatific, contented, etc…” do they? Words make a difference every single time. We use words to convey our feelings, our emotions, our journeys but we so often forget to dig deeper than the words leaping off the page (or screen) at us. We forget that behind the word “joy” there is a sour grape, lurking down the rabbit hole of the “o” in the middle of the word. Or we ignore the uncompleted circle in the “c” of carefree. 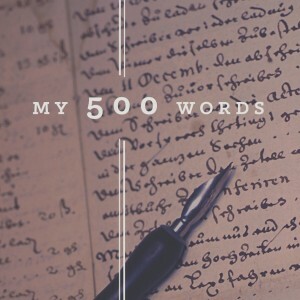 We use words to define ourselves to others in bios, in résumés, and on various other forms. Choose your words carefully for they reflect the journey of your life…of you. Our words falter when we trip down the rabbit hole that is a Perinatal Mood & Anxiety Disorder or other Mental Health disorders. So we dust off our thesaurus and desperately search for happy. But it’s not where we will find our happy. We will find our happy in the battles we fight as we journey back to ourselves. Join me tonight at 830pm ET tonight on Twitter as we discuss the challenge in finding ourselves again…the challenge of redefining our happy…it’s a helluva battle but it’s one worth fighting every time. See you there! This entry was posted in #PPDChat and tagged #mhsm, #PPDChat, peer support, redefining happy, social media, Twitter Chat on December 9, 2013 by LHale. This entry was posted in #PPDChat, Community Moderation, postpartum depression and tagged #mhsm, #PPDChat, advocacy, community moderation, mental health, peer support, postpartum depression, Postpartum Mood & Anxiety Disorders, Postpartum Mood Disorders, PPD, support, Twitter Chat on October 1, 2013 by LHale. Join us today on Twitter as we get nitty and gritty with the signs & symptoms of Postpartum Mood & Anxiety Disorders. Have questions about just what goes on inside a PMAD? 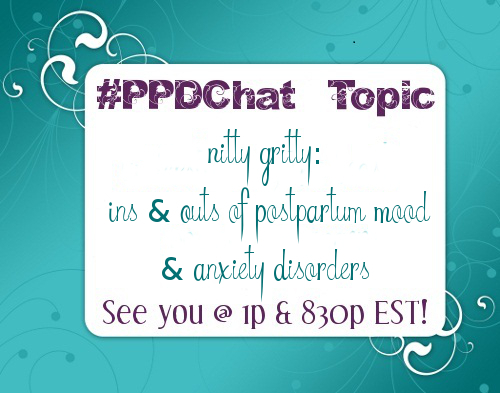 Catch up with us at 1pm ET and 830pm ET on Twitter using the hashtag #PPDChat. See you then! This entry was posted in #PPDChat and tagged #mhsm, #PPDChat, advocacy, depression, mental health, motherhood, peer support, support, Twitter Chat on September 23, 2013 by LHale.